PAC and its manufacturing partner, Rightway Industrial, Ltd., are pioneers in mass-producing the patented NASA alloys for internal combustion engine components. PAC and Rightway have been working jointly to develop and commercialize NASA aluminum alloys for gasoline and diesel engine pistons. 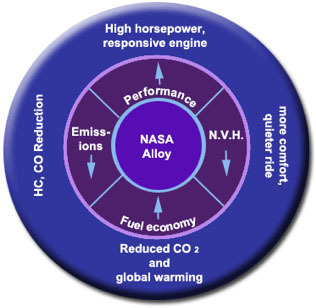 Upgrading power density as well as achieving further reductions in fuel consumption and emissions have been the motivations driving the demands for high performance NASA alloy pistons. Our piston products are particularly suitable for two-cycle recreational and racing vehicle engines as well as for four-cycle turbo-charged automobile and air-cooled motor scooter engines. Rightway Industrial, Ltd. is an international company that has production facilities in Taiwan, China, and Malaysia. Since being granted licensing rights to manufacture and market the patented NASA alloys several years ago, many notable OEMs have become regular customers of NASA alloy pistons. We also provide solutions for aftermarket customers seeking replacement pistons that can outperform the original equipment quality. Our dedication to quality manufacturing and aftermarket engineering specific to the repair environment means we can make your engine repair jobs easier, solve your problems and improve overall vehicle performance.